Many craft brewery’s have quirky, off-the-wall names for their different styles of beer. “Hop Drop ’n Roll,” “Sexual Chocolate,” “Palate Wrecker,” “Pliny the Elder,” whether their origin is a cultural reference or ancient history, many craft brewers want the names of their beers to stand out. At Upright Brewing in Portland, OR, however, you won’t find a “Sip and Go Naked” or a “Horny Devil” amid their regular line up of year-round beers. Instead, Upright has elected to let their flagship beers speak for themselves, as their four varieties that are available year round have a pretty simple set of names: Four, Five, Six, and Seven. These numbers are not simply serial, but rather refer to each beer’s original gravity, the pre-fermentation density of a beer that helps indicate what its finished characteristics might be. Upright’s year-round beers are uniquely suited for such straightforward nomenclature—names reminiscent of Theodore Roosevelt, “Speak softly and carry an excellent beer”—in part because, for all their unique qualities, all their differences in flavor and aroma, they share a single common ancestor: saison. With origins in the European Low Countries, traditionally this style of seasonal (whence the name ‘saison’) farmhouse ale is characterized by a bright golden hue, aromas of mild spice and citrus, and a clean bitter finish. While the first in their main series, Four, is a quintessential example of what a French farmhouse ale should be, as the numbers go up, things get funky—and that’s a good thing. Indeed, Upright may have brewed some excellent, ‘straightforward’ saisons, but they’ve also created some fantastic hybrids. 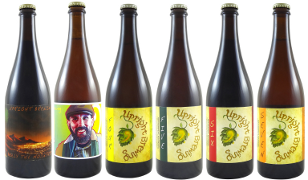 Founded in 2009 by Alex Ganum, who still serves as head brewer today, Upright Brewing runs the gamut from light, low-alcohol table beers to 13% alcohol Barleywine behemoths, with plenty of hybrids in between. Even if Upright sometimes brews to match a particular style, their lineup of beers is anything but traditional. And that is, after all, what jazz is all about: not just reproducing great standards, but also making them your own. If Upright’s series of year-round saisons take off on uncommon, hybridized flight paths, then this beer is their launchpad. A traditional wheat based French farmhouse ale, this table saison is light, crisp, dry, and tart, finishing with grassy and herbal notes—precisely what you’d expect from the style. The pale, wheat, and Vienna malts take center stage in this beer, and while the santiam hops help provide a bright bitterness in the finish, they’re not especially strong in this beer. At 4.5% alcohol, it’s an exceedingly drinkable beverage, which is a good thing, as it’s crisp light malt and clean tart finish will likely have you wanting a second or third glass. Lovely with a plate of crackers and hard cheese, or simply to sip by itself on the patio, this saison is sessionable yet complex, and will leave you wanting more. Upright Brewing’s Five is where the saison starts to take on a new life in the Pacific Northwest. One might be tempted to call this beer a hybrid between West Coast IPA and a traditional saison, but that wouldn’t quite do it justice. At 37 IBU’s, the Five has almost precisely twice the alpha acid content of the Four’s 18 IBU’s, and the hop bitterness comes through strongly on the palate, both slightly up front, and especially prominently in the finish. However, 37 is not nearly the IBU content of most IPA’s, and for good reason: by not going overboard on the hops, this beer still retains some of the lighter more subtle notes characteristic of saison: a slight ready flavor, and herbal notes coming through along with the hop aroma. A double IPA this is not—but if you’re interested to see what a saison looks like with some Willamette hops bringing up the finish, then this 5.5% beer is for you. Welcome to the Dark (Rye) Side. Pouring a deep amber color, this beer is even further afield from a traditional, light and golden saison. Brewed with roasted barley, pale, caramel, and rye malts, this saison is a darker cousin than anything you’ll find on the beaten farmhouse ale path. The rye malt combines with the saison yeast to create a flavor profile unlike any I’ve encountered before, something like a dark rye bread dipped in champagne. The nugget hops come through in the finish with a nice tight bitterness that balances the malts very well. At 6.5% alcohol, this beer is a bit stronger than the first two in Upright’s lineup, but not the kind of bruiser that will knock you down after a second glass. And with this beer’s inimitable combination of disparate styles, you’ll likely be wanting that second taste. From name to brew kettle, barrel to bottle, Upright Brewing is all about innovation and the desire to try something new. On America’s western coast, in Portland, Oregon where Upright plies their trade, IPA is king. But the folks at Upright aren’t keen to bend the knee; at this brewery, saison is the true sovereign. And with beers this good, including not only a fantastic traditional table saison, but also hoppy and rye riffs off that tradition, I am more than willing to pledge my allegiance to Upright’s saison—long may she reign.